I’ve always had this fascination for Ube (Purple Yam). This has been so intense that my favorite color has morphed to purple — the color of Ube. As soon as I got off my diet, Ube was one of the things that I blissfully reunited with–may it be in a form of a hopia, waffle, puto, kakanin or sweet bread. I found myself devouring anything ube-flavoured and in the process, I could say that I now have a more discerning palate when it comes to these ube delights. Let me share with you my top five favorite Ube Hopias! My parents know how much I love Ube Hopia so one day after work, my dad suddenly surprised me with a batch of Hopia Ube Special. Unfortunately, I wasn’t too excited since I had no idea who / what Salazar Bakery was. Upon opening the wrapper, the ube hopias did not look too appetizing either because they looked so flaky and crusty. Nevertheless, I told myself, ube hopia is still ube hopia. After heating the hopia, I was surprised how different they became. After doing some research, I was humbled to find out that Salazar Bakery is actually a big name in the authentic Chinese pastries industry and has been around since 1947. It is such a shame that Salazar seems to be still struggling to catch up with the times. Compared to Eng Bee Tin/Holland/Polland, their distribution and technological savvy is still in the start-up phase. Where I usually get my fix: I only had this once. Help on where I can find more of this? After gimmicks or for sudden random cravings, I would always hit 7/11 for my Ube Hopia fix. This is where I’ve encountered Polland Ube Hopia. Hopias are highly fattening and this brand scores pretty high in my preference scale as they sell these ube hopias in individual packs! This is perfect because it is just enough for you to purchase one piece and……… walk away with self-control and dignity. After some research, I’ve discovered that Polland Hopia is also a pretty established brand name in the industry as they’ve been whipping up Mrs Po’s authentic mung bean cake recipes since 1966. My family’s trip to Binondo is never complete without a visit to their flagship store at Quintin Paredes. We would buy tikoy, pilipits and of course, my favorite, hopia! An ube hopia first timer would probably have this brand as his/her first. Eng Bee Tin is an Oriental Delicacy chain that has its products available anywhere. A tiny trivia I learned: It started as a Hopia Factory in the 1870s but had difficulty selling its products. The purple yam cake was actually what saved the business. With their hopia expertise, they’ve become more adventurous with their flavors. My top picks are: Ube (Purple Yam), Ube-Keso (Purple Yam and Cheese), Ube Custard and Mongo Lite! Top of mind description: Extremely sweet, milky and soft. How much: PHP 50+ for four pieces. I was feeling a bit under the weather one Friday afternoon when I requested my parents to drop me off some Nafarin-A. After opening the Mercury Drug Bag, I was surprised to see that along with the meds were a pack of Ube Hopia! I’ve always ignored Fortune Bakeshop hopias at Mercury Drug outlets because they would always fail my pinch test as they were always too hard. (I always pinch my hopia or bread to see how soft they are). Thankfully, my mom introduced this to me because it was the perfect marriage of three of my favorites: ube hopias, pastry crusts of empanada and the tasty filling of Pan De Ube bread! SUPER PERFECT HEAVEN. Fortune Bakeshop is actually a “newbie” when we talk in terms of age in the hopia-making business as it was only established during 1985, but what it lacks in age it makes up with its expertise in food manufacturing. It’s actually a brand from MLM Foods, Inc. a food manufacturer that serves high-quality bread and processed meat products (Other brands are: Sausage Haus, Basta!!! Hot Pandesal and Imang Telang which serve processed meat besides bread products.). I always remember passing by the old Bakers Fair in Virra Mall ever since my grade school days. Even though the bakery was somewhat rowdy, what always stood out was the constant line of people waiting for some freshly-cooked hopia. 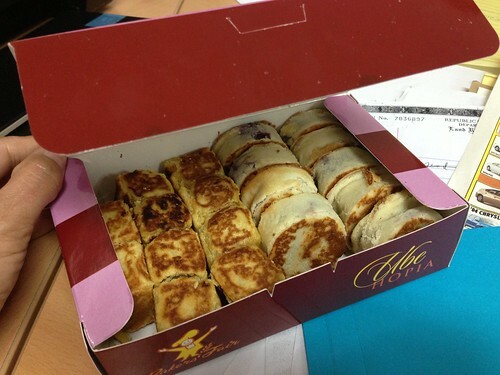 A couple of months ago, my office mate surprised me with a box of Ube Hopia from Bakers Fair. Despite it being bought two days before, the ube hopias remained tasty and blissfully creamy. Words cannot describe how heavenly it was when I microwaved it. Bakers’ Fair & Foodmart, Inc. is another bakery that started in the 1960’s in Manila. They’re actually popular for the Pullman “tasty” bread (a name that has become synonymous to sliced bread before Gardenia came around). Where I usually get my fix: Ground Floor, Viramall, Greenhills. Just look for a long queue of individuals scrambling to get their freshly cooked hopia! Thanks for the list! I’d looove to try the Baker’s Fair hopia, too bad I don’t go to Metro Manila that often anymore. I bought the Polland one but I haven’t tried it yet – it’s 40 pesos at SM Pampanga! I feel duped, haha. I’m off to search for the Eng Bee Tin (awesome name) brand, sana meron! I hope you find Eng Bee Tin over there. But if not, at least you have a to try list when you come visit Manila! 😉 Good luck!!! !